I am off on one of my semi-regular jaunts to the UK for the purposes of research and fun (which are usually the same thing). 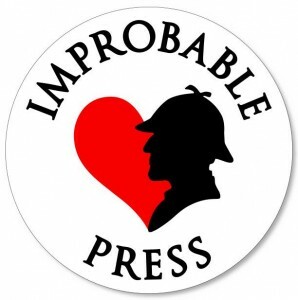 2017 marks 125 years since Arthur Conan Doyle’s collection The Adventures of Sherlock Holmes was published (1892) and 130 since A Study In Scarlet first saw print. In fact, VisitBritain is all about 2017 as ‘the year of the literary hero‘, referencing anniversaries related to Jane Austen, Enid Blighton, the Harry Potter books, the death of war poet Edward Thomas and more. My own special interest in Sherlock Holmes – in both queer and bromance interpretations – is leading me to Holmesian London over a the next three days. I aim to incorporate a few of these details into both Victorian and modern Holmes stories I’m working on. 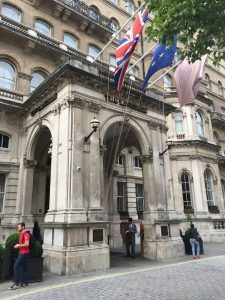 The Langham Hotel on Portland Place (off Regent Street) has more than one connection with The Great Detective. Famously, it was at the Langham’s dining room in 1889 that Oscar Wilde and Arthur Conan Doyle (not yet ‘Sir Arthur’) met with the publisherJoseph Stoddart. They were commissioned to write A Picture of Dorian Grey and The Sign of Four respectively (and even gave each other cameos in the resulting books). Doyle went on to assign the Langham as the hotel of choice for three of his characters: The King of Bohemia (A Scandal in Bohemia), Mary Morstan’s lost father (The Sign of Four), and the former tearaway and poet Mr Phillip Green (The Disappearance of Lady Frances Carfax). 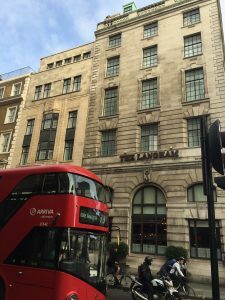 The Langham remains every bit as charming and elegant as its literary history suggests. The various restaurants and bars are lovely spaces to visit the hotel and raise a glass to Conan Doyle and his creations. The Sherlock Holmes Walking Tour of London, conducted by Chris Taylor of Britmovietours, is marvellously inclusive of Conan Doyle’s original stories, several films, the recent BBC and U.S. television adaptations, and even a glimpse of my favourite, the show that brought me to Holmes, the Jeremy Brett Granada series from the 90s. Chris is enthusiastic and, even better, knowledgeable. I know a lot about the world of Holmes, having researched and read the stories multiple times as prep for writing The Adventure of the Colonial Boy and some upcoming short Holmes + Watson stories, but he was still able to surprise me with some tidbits about canon and BBC Sherlock. 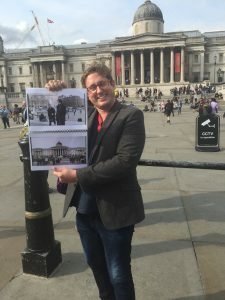 The walk starts on Piccadilly Circus at The Criterion Bar, where John Watson’s old friend Stamford famously noted that he knew someone who might want to share ‘comfortable rooms at a reasonable price’ with him. 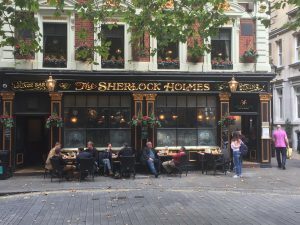 A meandering two hour wander took us past filming locations, over Waterloo Bridge and past some of Conan Doyle’s real-life haunts and inspirations (including the former Northumberland Hotel, now the Sherlock Holmes Pub) to fetch up at Somerset House. The latter is no longer the repository of records of Births, Deaths and Marriages but it stands in as a less reputable location in one Holmesian film. The walk is £12 for adults: very reasonable given Chris’s energy and knowledge shared over two hours. If you want to know more, visit and book here. I am about to topple over from lack of sleep (I touched down this morning, and headed out with half a globe and five hours sleep under my belt – GO ME!). Tomorrow I’ll visit an exhibition and take another walk – so more reports from the field (hopefully more useful than Dr Watson’s during The Solitary Cyclist) are coming! Pssst. While you’re reading, please consider reading my new short story Near Miss, and my M/M paranormal thriller, Ravenfall, which is set in London!